Bingo Gala is rises to the occasion with over ten years of quality online bingo. That is a quite a feat considering the fierce competition. They are a legend in their own time and once players join they’ll quickly see why. The bold red website makes a statement that says never underestimate the power it reflects. They have surpassed many other online bingo sites and persevered. Their recipe for success is really quite simple, quality. 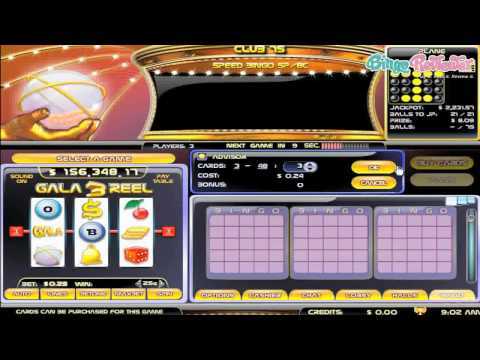 Bingo Gala has quality service and gaming and what has given them their longevity. Launching in 1999 they established themselves as a superior bingo operator and have maintained a modern fresh approach with a vision to continuously evolve. Byworth Entertainment software is the anchor that has propelled them into the success they are today. The graphics are robust and developed by one of the greatest teams in the business. Bingo Gala invites all players to partake in a survey that is located on the homepage. Players’ opinions and suggestions are always welcome. Bingo Gala is under the umbrella of Bingo Entertainment Ltd and owned by Plex Gaming N.V. They are regulated and licensed by the Government and State Law of Curacao in the Netherlands. Nothing gets better than Bingo Gala when it comes to bingo variety. Every online bingo game there is can be found right in the lobby. It is a bingo player’s paradise offering 90 ball, 75 ball, 80 ball and 30 ball bingo. Another great feature is player can purchase up to 100 cards per game offering bigger odds to win. There are 8 magnificent bingo rooms to choose from with 90 ball bingo having the most rooms available due to popular demand. There are an amazing four Free Bingo rooms open with your choice of 90 ball or 75 ball games and a chance to win real cash. The Progressive Jackpots are available in all paid games including one free bingo room. Side Games and Chat Games add to the ambiance of bingo with automatic daubers for a hands free experience. For the adventurous gambler other gaming options are filling the lobby up with Slots, Instant Games and Casino Games. Joining Bingo Gala is really worthwhile with a free No Deposit Bonus to try the games out with nothing to lose and everything to gain. Make your first deposit and a Deposit Bonus is offered. There is a schedule for all the bingo rooms with special promotions available on a daily basis. Guaranteed prizes for as little as one penny and Mega Bucks bingo with a lucrative minimum payout prize are just a small part of the daily specials. Chat Games are hosted by the chat moderators for a chance to win Bingo Bucks (bbs). BOGOF games, Powerball with a guaranteed cash prize and Cash Climber – everything must go jackpots are among the favorite promotional offers. Budget Bingo scheduled games are the perfect solution for players who want to reserve their funds. With a history that spans 11 years, Bingo Gala has built a reputation of premium services to players. The site is crisp and rich in design with user friendly features. We rate Bingo Gala with 4 Pink Hearts. Bingo Gala has a good site, but with a layout that doesn't really makes it easy to read. Red background with white and yellow letters is not really that comfortable to use over longer period of time. I did find the games software (Byworth Entertainment) really refreshing and feeling smooth and fast. The games look modern and really no complaints there. You start by getting a $10 no deposit bonus, just for registering the account (the code you have to use is GALAN). So, even before you make any deposit, you can just try out the games, and if you're lucky enough (and I am sad to say I wasn't), you can even win some real cash). Naturally, in order to withdraw the cash won from the no deposit bonus, you have to make some deposits first. They have all the popular Bingo games available: 75 and 90 ball games you usually see, but also the 80 ball and fast paced 30 ball as well.